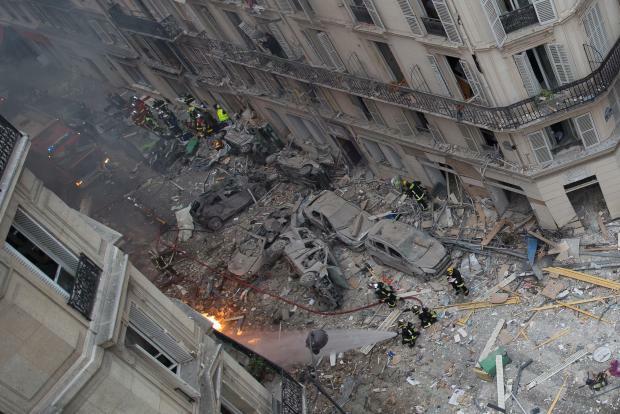 The death toll from a powerful gas explosion in central Paris has risen to four after rescue workers found a woman's body in the rubble, investigators said Sunday. Two firefighters and a Spanish tourist were also killed in the Saturday morning blast that injured dozens and badly damaged nearby apartments. Rescue workers with sniffer dogs had earlier searched for a missing woman who lived above the explosion site and who was believed to be in the rubble. A source close to the investigation said the body could be that of the missing woman. The blast gutted the lower part of the building which housed a bakery and a restaurant, and also overturned cars, leaving glass and rubble strewn across large swathes of the street. Around 50 people were injured, nine of them seriously, including several foreign tourists who were in the area to visit local attractions like the Musee Grevin wax museum and the popular Rue des Martyrs. A fire service spokesman said 40 firefighters were clearing the debris by hand on Sunday due to the dangerous conditions. "We will only leave once everything is cleared, stone by stone, to be certain there is no one else," he said, indicating that such an operation could last for about a week. Given the extent of the damage, around 50 people were put up in temporary accommodation. Twelve buildings remained closed on Sunday, with officials saying the safety of each would be assessed. In a city that has been shaken by a string of terror attacks in recent years, the huge blast jangled nerves. "I was in bed when it happened, I heard a muffled boom, it moved the building," said Sylvie, who lives close to Rue de Treviso where the explosion occurred. "I heard the sirens. I burst into tears." Others were out trying to repair some of the damage, with Philippe Benoliel attaching wooden panels to the front of his tourism business that is located on the same street. "When I arrived this morning we found two windows blown off, glass shards everywhere. The explosion 200 metres away caused all that," he said. "It could have been worse -- we don't work on Saturdays." Local resident Soufiane, 28, was one of many people who came to lay flowers at the site. His bouquet had a note saying "For Laura", the Spanish tourist who died. "As soon as I heard the noise, I went out to see what was happening. I heard this Spanish woman calling for help," he said. Her head was covered in blood and she was taken to a nearby hotel where two doctors, still in their pyjamas, tried to help her, he said. "When the ambulance took her away, she was still alive." The blast was believed to be accidental, but Paris prosecutor Remy Heitz remained cautious. "At this stage, we do not exclude any hypothesis," he said. Christian Buffet of gas distributor GRDF said it was "too early to identify the cause" of the explosion, which he called the largest and most serious in more than a decade. French President Emmanuel Macron tweeted his condolences to the "families, loved ones and comrades of the two hero firefighters", adding that his thoughts were with all of the victims.